Research is central to an undergraduate education in the sciences. In the Faculty of Science, we aim to provide you with the chance to experience and participate in research throughout your degree. There are various Undergraduate Research Opportunities (UROPs) with Dal Science. Conducting research in laboratory and field settings is usually how students get their start, and many continue on to conduct independent research through an Honours program or a scholarship program that supports student research during the summer. Once a student has participated in real research, the experience becomes an integral part of their learning and success. Dalhousie University is one of 15 research-intensive universities in Canada. The Faculty of Science and its departments coordinate various structured UROPs (see options in the sidebar to the right), but students are also encouraged to seek volunteer positions in research labs as a first step to getting involved in research. Browse the Faculty of Science and Departmental UROPs listed on this website. Review all available guidelines and application forms to see if the fit is right for you. All of these particular UROPs are listed further down this page or through the sidebar to your right. Speak to the professors of classes that intrigue you. The earlier you can do it, the better. Explain your interest in research and ask for advice on how to get involved. A professor can sometimes offer an opportunity in their own lab or point you to someone else. While the Faculty of Science and several of its Departments coordinate various summer research awards, some professors are equipped with their own funding to hire undergraduate students in their labs as well. Others may be interested in helping an undergrad learn the ropes through a volunteer position. We encourage you to start having discussions with professors early in the academic year. Many potential supervisors will work with eligible/qualified students on a first-come, first-serve basis. Undergraduate students are very welcome at all departmental seminars. You’ll learn from experts in the field and hear about recent advances and current challenges. You’ll have an opportunity to meet professors you may not know, and other students (including those doing research at the graduate level). Seminars can inspire you to take a keen interest in a particular area of research. Most departments hold at least one seminar a week. Keep an eye on the weekly student e-newsletters from the Faculty of Science and the Faculty of Science event calendar for seminar information. The items below explain, in short, the opportunites available for undergads. Learn more through the links in the sidebar to the right. 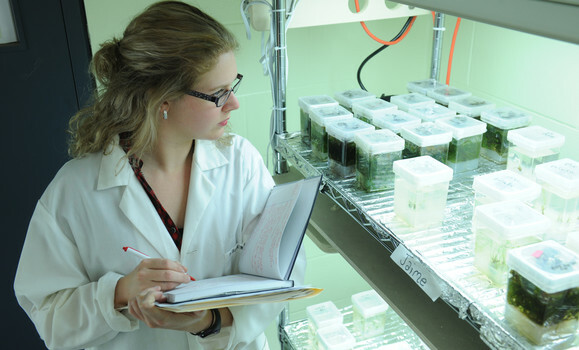 Summer Research Awards: paid work in a Dal Science lab between May-August. Honours Research: spend your last year conducting an independent research study under the supervision of a professor. Conference Travel Funding: apply for funding to support travel to a scientific conference. Experiential Learning Courses: certain degree programs offer courses with a hands-on research component that count as a credit towards your degree requirements. Integrated Science: an year-long program option for first year science students with a focus on research and field work.